Day One of Sedation Safety Week might well be dubbed, Proclamation Day. Or Declaration Day. Or Manifesto Day. Or Mission Statement Day. Regardless of how you label it, we begin our 9th annual week-long focus on education, training, and dental patient safety with a call to set in writing what it is about dentistry — and your practice in particular — that serves as your inspiration and as a torch for others to follow. Sedation dentistry is a calling, not merely a profession or a means of earning a living. Through sedation dentistry, we serve a vast portion of the general public who, due to their fears and anxiety, would otherwise avoid seeing a dentist altogether. We share a collective pride that more than 22 million Americans have already been safely and effectively treated by specially trained general dentists using oral sedation. But perhaps as many as 70 million additional friends, neighbors, coworkers, and family members still dread going to the dentist — or simply don't go — because the miracle of oral sedation has not yet touched their lives. On a day-to-day basis, most of us oral care providers go to great lengths to serve our patients, keep our practices running smoothly, maintain and train staff, and balance all of that with our commitments to family and community. With phones ringing, broken or malfunctioning equipment, team members who call in sick, and the myriad of other distractions that are part of everyday dental practice life, it's understandable that we sometimes get so caught up in the moment — marching through our daily to-do list — that we lose sight of the BIG PICTURE. That is one of the main reasons we began Sedation Safety Week back in 2009: To take an annual "time out" from our demanding routines to focus on patient safety and safe oral sedation practice. SSW is an entire week, timed annually to coincide with the start of daylight savings time, when we can all recommit to the safety and comfort of our patients. This year, we're launching Sedation Safety Week with a drive to get all sedation dentists and their team members to step back — if they haven't already — and put into writing a statement that reminds them of the BIG PICTURE, the definition of who we are as health professionals and the purpose we have been called to serve. 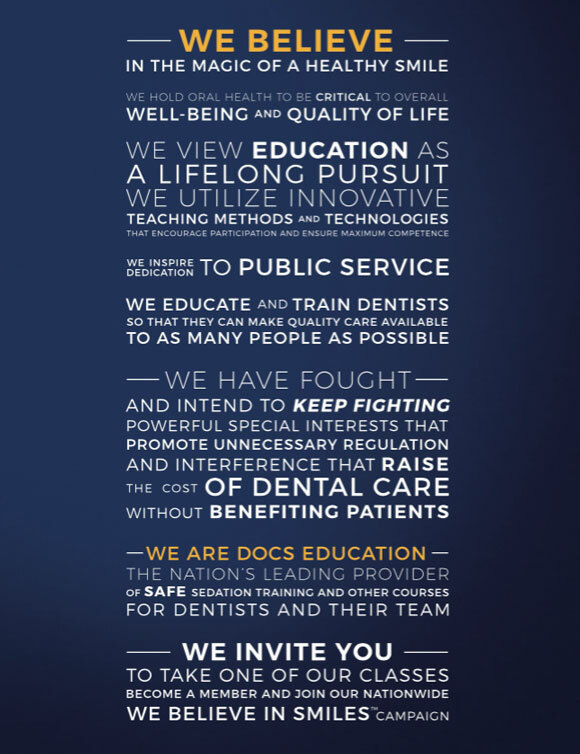 Last fall, we at DOCS Education — the annual host of Sedation Safety Week and the world's leading educator of sedation dentists — began our own dialogue about formulating a "Proclamation" that would not only remind us daily of who we are and what we strive to achieve, but would also let everyone who we encounter know our vision and our goals. Our Proclamation, which you'll find below, begins: "We believe in the magic of a healthy smile." A large, poster-size display of our Proclamation now hangs in our office entryway, and we share our Proclamation with members, vendors, and course attendees at every opportunity. Beginning today, why not start the discussion with your team of what your Proclamation should say? When you've gone through the exercise and are proudly displaying your Proclamation in your waiting rooms, it will help remind you of just how much good you do for your patients and your community. You are a sedation dentist. It is an honorable calling. Until recently, the standard equipment for oral sedation was a pulse oximeter continuously registering heart rate and blood oxygen saturation, as well as taking blood pressure at regular intervals (DOCS Education recommends 5 minute increments). Capnography works differently, having a number of important advantages over SPO2, but requiring a nasal cannula to directly measure exhaled CO2, and of course the relevant input on the monitor or standalone capnography unit. Many dentists are intimidated by both the price of these units and the additional element of complexity they add to the monitoring setup. Furthermore, it's a device that until recently was not commonly seen outside of hospital anesthesia, and new users may have difficulty interpreting the readout. On October 24, 2016, the new ADA guidelines (Resolution 37) went into effect, requiring capnography for all moderate sedation procedures, and a number of states have already adopted capnography before the ADA guidelines changed (OR, NH, GA, TX, VA, NY). More are likely to follow, so like it or not, it's better to get on board sooner rather than later. So why the big push for capnography? Well, EtCO2 differs from SPO2 in that it measures exhaled carbon dioxide in real-time, rather than blood oxygen saturation. This has a number of advantages that are conferred upon the sedation patient. First, capnography is an instant display of a patient's respiration, possibly the most important vital sign to monitor during a sedation procedure. SPO2 is actually not a great measurement of the patient's airway status, since it measures respiration indirectly. By the time the saturation begins to drop, the patient has already stopped breathing and you must begin resuscitation immediately. With capnography, you can directly observe respiratory distress and take action before the patient actually experiences respiratory arrest. The readout from a capnograph may be unfamiliar, but it's simpler than it looks. Let's analyze a single respiration, then look at some patterns. Depicted in figure one is the carbon dioxide levels present in a single full respiration. From A to B, the patient is inhaling, and as we'd expect, levels of carbon dioxide are very low. Also contained in this region is the beginning of exhalation, where the room air that did not fully enter the lungs is exhaled. B to C is the beginning of alveolar exhalation, where the spent air from the lungs (high in CO2 content) mixes with the room air in the trachea and bronchi, showing a steep rise in the CO2 concentration. From C to D, the patient continues to exhale and reaches a plateau of the highest CO2 content. The single data point D is the "end tidal" value, representing the peak concentration of CO2. Finally, D-E is the inspiration washout as the patient finishes exhaling and begins to inspire again. Every plateau is an exhalation, and every valley is an inspiration. Many vital signs monitors have support for capnography built in, and only require the separate purchase of the nasal cannula system and some simple setup. The end-tidal value can be configured to sound an alarm the moment expired CO2 exceeds a predetermined level. Some units also support the detection of atypical respiration patterns. Capnography offers dentists and patients increased safety with earlier warning of any respiratory issues, however uncommon, that may be encountered in the sedation practice. 1. DOCS: When did you first become a DOCS member? Dr. Kaveh: It was about one year after I graduated from dental school. I think it was 2002 or '03. 2. What about sedation dentistry captured your interest? I was working for a big dental group, and as the most junior doctor, I was getting the patients the other docs didn't want to work on. They were all really nice people, but they were hard to get numb, didn't show up for appointments, gagged and were pathologically anxious. One of my dentist friends suggested trying to oral conscious sedate these patients and so I started looking into sedation and researching it. That is when I found DOCS! 3. Do you have a personal hero or mentor who encouraged you on your journey through dental school? Dr. Ara Nazarian has been a terrific implant mentor to me. He is one of the biggest names in implantology and I'm I've taken his courses and he has come to my office several times to help me with complex implant cases. Now he is the director of the Ascend Implant Academy. He introduced me to my orthodontic mentor below. Dr. Rick Depaul has helped me implement adult orthodontics into my practice. Rick has done so much for dentistry and he makes himself available when you have questions or need help. He and his wife Margie are terrific people. I can't recommend his courses highly enough. Dr. Arun Garg is one of the most trusted implant teachers in dentistry (and a fantastic person). His courses are comprehensive, and he has a continuum that ends with his students placing implants on live patients in the Dominican Republic which is an unparalleled experience in continuing education. I am grateful that Dr. Garg encouraged me to start speaking to dentists on the benefits of cone beam technology and implants in the general practice. Dr. Chris Stevens teaches THE BEST occlusion and TMJ courses I've ever taken, and his office is only a 10 min drive from mine! For years I traveled to different institutes and took tons of TMJ and occlusion CE, but Dr. Stevens's is the best. It's also the most cost-effective and the easiest to implement. Dr. Silverman for starting DOCS and although I've only talked to him a handful of times, the organization he built has been inspiring. Hernan Varas from Arrowhead Dental Lab who is always helping my team work at providing top notch customer service and being able to help our patients move forward with treatment. I am astounded that all of these leaders in the dental field find time to return calls and e-mails. They are great people who put their time and energy into helping elevate dentistry for our patients, and I'm grateful to each of them. 4. What is the most important benefit that sedation grants your patients? It grants my patients peace of mind. They learn that they don't have to be afraid anymore, and that's huge. 5. What advice would you give a dentist considering offering sedation in their own practice? I would say RUN, don't walk, to the nearest course so you can start to learn about it! 6. What in your opinion is the biggest misconception the public has about sedation dentistry? Some patients come to our office specifically for sedation, but for those who found us for other reasons, I still find that most of my new patients have never heard about sedation dentistry, so it's something we have to educate them about. It's not just taking a pill and going to sleep! 7. What do you think Sedation Dentistry is moving towards as a profession? Unfortunately it seems that legislation is being pushed that will hinder patients' ability to receive sedation dentistry. The positions I've seen on limiting sedation appear to have more to do with turf wars between specialties than actual patient safety. They definitely don't take patient welfare and needs into account. It's a shame, and I hope that we can come together as a profession and overcome this type of nonsense. Let's get back to taking care of our patients in the best way possible! In September 1978, Blondie released their third studio album, Parallel Lines. It was their international commercial breakthrough and has since sold over 20 million copies. It spawned several hit singles, not the least of which is one of the most famous and beloved disco songs ever, "Heart of Glass." How does this album title relate to dentistry? It doesn't. But I did borrow (okay, steal) it to make a point. When something goes awry as a dentist (or in any of the recognized professions), there are parallel lines of liability (agony) that you will have to deal with. What happens when I get into trouble with the dental board? What happens if/when I get sued? Too often, dentists are more concerned with #1 than #2. Both will threaten your livelihood. Why take a chance? Ponder that a while. First, it's really two questions. Second, it's really two completely different questions. Most states don't require a permit for single-dose or anxiolysis (archaic definition). Some states allow most or all the DOCS protocols and do require a permit for minimal sedation, while others don't. The states that require a permit for minimal sedation also require a pulse oximeter. Thus, if you don't have the monitor, you're in violation. For those states that don't require a permit for single-dose/anxiolysis/minimal sedation, they likewise don't require a pulse ox. Are you off the hook? Are you being sued? Aren't you glad I'm on your side? You see where I'm going with this. Don't put yourself in that position. Don't be "that guy." Don't be the cheapskate. Don't be afraid to practice above the standard of care. Nobody ever got sued because they were overqualified. *Same goes for an AED. It's been almost 17 years since Dr. David Satcher issued his landmark Surgeon General's Report on Oral Health. The report cemented the public's understanding of the scientific links between oral health and the health of our organs and anatomical systems. The association between chronic oral infections and heart and lung diseases, stroke, and low birth weight were highlighted, as well as the ties between periodontal disease and diabetes, among other illnesses. Dr. Satcher encouraged policymakers and the public to recognize that the mouth is a "mirror" of our general health and well-being. Dr. Satcher's report in May 2000 did not elaborate on the links between oral health and mental health, although a growing body of scientific evidence in recent years makes it abundantly clear that when our teeth and gums are unhealthy, we are far more likely to experience depression, anxiety, stress, and other mental health ills. We launched the 9th Annual Sedation Safety Week with a proclamation from DOCS Education that begins: "We Believe in the Magic of a Healthy Smile." Indeed, a warm smile brings with it an abundance of good feelings and emotions. What is well-established, however, is that tens of millions of Americans are hesitant to smile, or never do, because of oral pain or because they are ashamed of their broken teeth, missing teeth, stained teeth, crooked teeth, bad breath, and similar issues. These men, women, and especially sadly &mash; children, are not just missing their "Kodak moment." They are missing out on the many mental health benefits of smiling, as well as the many social interactions that are predicated on the ability to smile at one another. There are three core reasons that people neglect their oral health - and their smiles. 1. A lack of funds. 2. A lack of proper education. 3. Fear of visiting the dentist. These three causes are often intertwined. While more than 22 million Americans have safely and effectively been treated using oral sedation â€“ which markedly reduces or eliminates dental fears â€“ far more Americans remain unaware of the availability and effectiveness of these treatments, which began to be widely offered by mainstream dentists around the time that the Surgeon General's report was issued. For patients, seeing a general dentist who has specialized training in oral sedation â€“ and practices in accord with ADA guidelines and their state regulations - the cost of regular dental checkups is far less than the price, in dollars and health, that the same patients will have to pay if they neglect their teeth and then require the services of an oral surgeon or other health specialist who must treat them with general anesthesia. Nonetheless, the cost of all dental care continues to rise, fueled, in part, by powerful special interests that promote unnecessary regulation and interference. As it was in 2000, access to care remains a vital issue that dental regulators and leaders in the profession have yet to address adequately. For dentists who provide oral sedation or are considering offering the service to their patients, as well as the leaders and regulators who set the guidelines for the dental profession, it is vital to recognize the associations not just between oral health and general health, but also between oral health and mental health. Toward that end, we've reviewed the published literature on the mental health benefits of smiling, as outlined below. Most of our citations are from psychologists, psychiatrists, social workers, and other mental health professionals who've written on the subject of smiles and mental health at PsychCentral.com, the largest and oldest independent online mental health network, serving more than seven million people monthly. Keep in mind, men, women, and children who don't smile, miss out on the myriad of benefits. • Multiple studies have found a correlation between displaying positive emotions — including smiling — and longevity. In a 2009 study, researchers Ernest L. Abel and Michael L. Kruger, studied 230 images and individuals, scrutinizing the nature and intensity of their smiles. "Most notably, how well they smiled predicted how long they lived," observed Daniel Tomasulo, Ph.D., in reviewing the Abel and Kruger research. • Smiles Lower Blood Pressure, Fight Stress and Increase Mental Clarity. In separate articles on the benefits of smiling, Athena Staik, Ph.D. and Gerald Schoenewolf, Ph.D. write that among the benefits of smiling are lower blood pressure, increased clarity of mind, and the release of neuropeptides - that fight stress - and the feel-good neurotransmitters dopamine, endorphins, and serotonin. • We Feel Happy Because We Smile. So says Alex Korb, Ph.D., a neuroscientist writing in Psychology Today. "Facial feedback works because the brain senses the flexion of certain facial muscles (like the zygomatic major, which is required to smile) and interprets it as, 'Oh, I must be happy about something.' Similarly, if that muscle isn't flexed than your brain thinks, 'Oh, I must not be happy." • A good way to make a new friend is to smile. A study published in the journal Motivation and Emotion by Belinda Campos, Ph.D., found that people are much more attuned to positive emotions [such as smiling] when forming new bonds than they are to negative ones, such as anger, contempt, or sadness. • Smiles truly are contagious. A review in the journal Trends in Cognitive Sciences by social psychologists Paula Niedenthal and Adrienne Wood suggests an instinct for facial mimicry allows us to empathize with and even experience other people's feelings. • Smiling Increases Good Samaritan Behavior. French researchers Nicolas Gueguen and Marie-Agnes De Gail conducted an experiment using 400 men and 400 women passersby to measure their willingness to lend a hand to a research confederate who "accidentally" dropped his/her computer equipment on the ground. When the passersby first encountered a second confederate who smiled at them, they were 50% more likely to help out. • Smiling Makes You More Attractive. Researchers in Bern, Switzerland found that less attractive but happy faces were judged as equally or even more attractive than good-looking but less-smiling faces for both men and women. • A Sincere Smile Can Help You Land a Job. Recruiter.com advises job seekers to display a genuine smile that will "put you ahead of the pack and give you an edge on the competition, even if the competition has better credentials or more experience." These are just a sampling of dozens of journal and psychology articles expounding on the many mental health benefits of smiling. The cost to all of us of allowing large segments of our population to pass their days with blank faces, frowns, or pained expressions is incalculable. There is genuine magic in a healthy smile and everyone deserves to enjoy the benefits of it.